Located in the UK’s busiest shopping district, Bond Street station is expecting to see an increase in rail transport by at least 10 per cent per year, with the speed of travel across London increasing due to the arrival of the Crossrail Interchange in 2018. 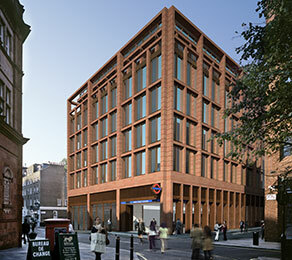 CCL was commissioned to design and supply the bearings in the western ticket hall of the new Bond Street station in London. From an early stage, CCL worked with the project’s consulting engineers to suggest suitable bearing solutions to fit within the design of the hall. The bearings were designed to fix the temporary floor levelled truss structure, used in the construction phase and employed to support the permanent concrete floor during top down construction. A key advantage of CCL’s involvement was its ability to quickly provide design changes as the specification evolved and suggest design limitations to help with the development of the construction sequence. The designs were developed from elastomeric bearings to a bespoke mechanical bearing configuration. To meet the challenging installation requirements on the project, CCL designed and supplied the compact bearings with additional welded tapered plates, which simplified the removal of the bearings after construction was complete.